Fore!!! Look out for an island home truly like no other. This Palmetto Dunes retreat has spectacular lagoon and golf views of 5 fairways and 3 greens of the Robert Trent Jones Golf Course, and the unique 11-mile lagoon system–from every room! 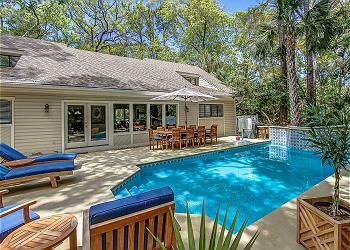 This home has it all with upscale touches and amenities such as stone and hardwood floors, high ceilings with wood beams, private guest suites, two king masters with private baths, intercom system, and the beach is just a 3-minute stroll away. 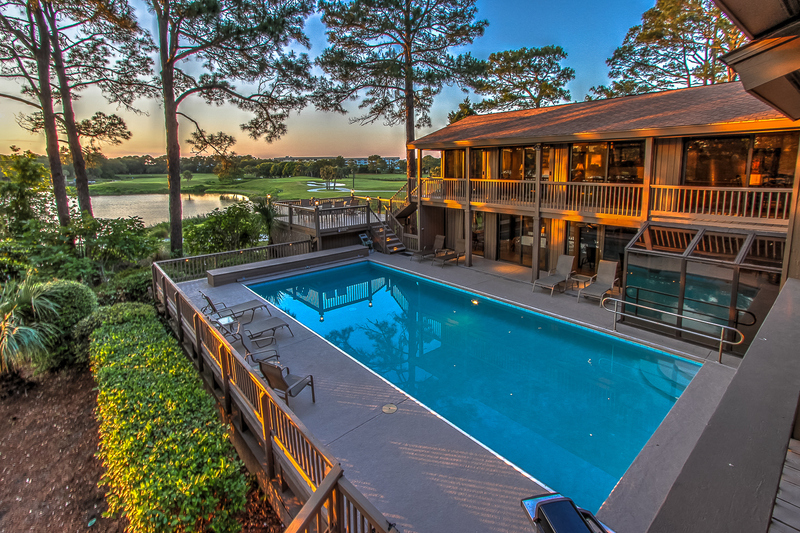 A truly exceptional house for any island getaway, and simply perfect for large golf outings. •	*Pools can be heated at an additional charge. This pool has a propane heater. The cost per week is $575-$1,000 (depending on the season) to heat pool. •	The Fireplace and the Steam Shower is not for guests use due to liability issues.